ROCKAWAY, NJ (KTRK) -- A father's Facebook post about his son has gone viral online. 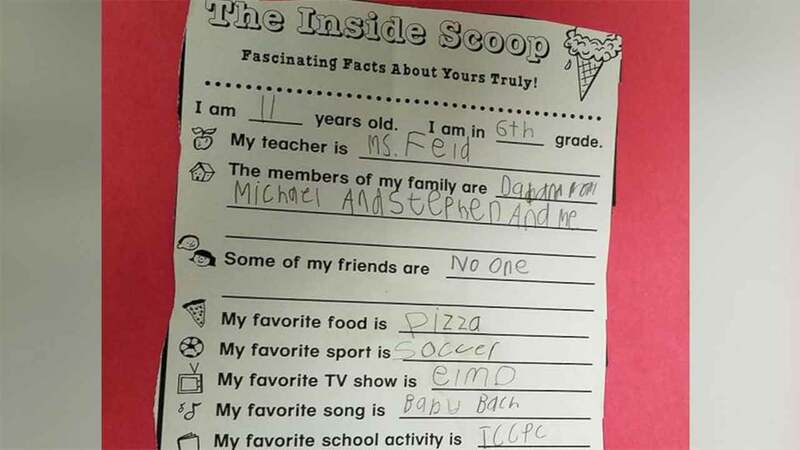 Bob Cornelius posted a photo taken of his 11-year-old son's schoolwork in which his son filled in the blank after the phrase "Some of my friends are ..."
Cornelius' son answered, "No one." Cornelius told ABC News the answer was "like a punch in the gut." In a Facebook post that's now been shared more than 12,000 times, Cornelius detailed his thoughts on not only his son, but how children everywhere who don't fit the mold are being excluded. Read the full post below. If you would like to write to Christopher, you can mail him at the address seen in the Facebook post. For more on this story, go to ABCNews.com.